Dubai, UAE, October 29, 2018: Retail Pioneer ‘Union Coop’ organized a Press Conference to unveil its upcoming Mall project in ‘Al Warqa’, which will be known as ‘Al Warqa City Mall’. This new shopping mall is an extension to its series of community malls, aiming to serve the neighbourhoods, aconcept that started with its Al Barsha and Etihad Malls. 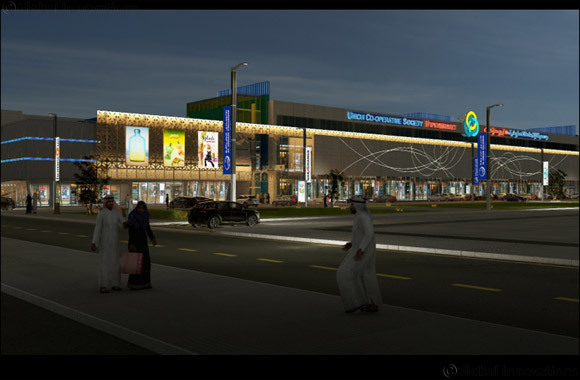 Al Falasi, also added 'Al Warqa’a City mall will include a variety of services, including the provision of Union Coop hypermarket of new concept called (Extra Coop). In addition to financial services in the form of Banks, Exchange companies and ATM services, and provide a chain of Gold and Diamond Jewellery shops. Visitors will also be able to take advantage of the healthcare facilities in the form of Pharmacy services, General as well as specialized Medical clinics. Moreover, there will also be stores of mobile phones & Accessories, oriental and occidental perfumes, flowers, salons and much more. In addition to financial services in the form of Banks and ATM services, there will be a chain of Gold and Diamond Jewellery shops. Visitors will also be able to take advantage of the healthcare facilities in the form of General and Specialized Pharmacy services, Medical clinics. Moreover, there will also be stores of mobile phones & Accessories, perfumes, salons, specialized car service centres and much more. A commercial centre project on Hassa Street with a construction cost of AED 80 million. It will consist of a basement for public parking, stores and other services. The ground floor has been allocated to a number of shops, public parking spaces and vertical movement elements. The Union's hypermarket will occupy the entire first-floor area and the excavation and shoring works for this project will start in the coming month. Commercial Residential Project in Motor City The project will include 2 basement floors; first for visitors parking, stores and services while the second is dedicated as residents parking. The ground floor has been allocated to a number of shops, visitors and vertical movement elements, whereas the first and second floor will be residential apartments. There will also be a Union Coop hypermarket occuping the Mezzanine floor in full. Commercial Center in Jumeirah First – located on Al Wasl Road, Al Bada’a area with an estimated cost of AED 45 Million. The project is currently in the tender stage and in process of appointing of a contractor to start the constructions work. Union Coop Central Warehouse Project in the folding area will be built at a cost of AED 65 million. The project is currently in the implementation phase and the expected completion date is February 2019. Jumeirah commercial center in the area of Jumeirah-3 with a construction cost of AED (282) Million. The Nad Al Hammar gardens Buildings in Nad Al Hammar Gardens area at an estimated cost of AED 170 Million. Coop Project / The Point area at Palm Jumeirah (rented commercial space). Commercial building/offices in the first Al Quoz area at a cost of AED 44 million.